Wales prop Rob Evans admits the pressure is on him after being selected ahead of Gethin Jenkins for the Six Nations game against Ireland. 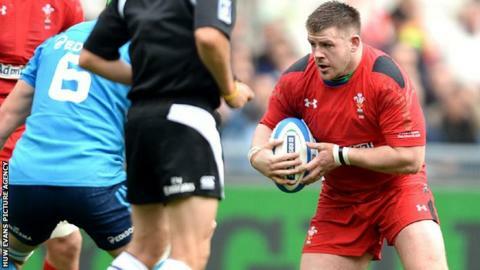 The 23-year-old Scarlets loose-head will win his fourth cap in Dublin, with 119-times capped Jenkins on the bench. He concedes Jenkins and Paul James - who does not make the match day squad - were his idols as a young player. "It's definitely a big opportunity for me but Gethin and Paul aren't bad boys to fall back on," he said. "If I don't take it, there are two boys behind me, Paul and Gethin, who will." Coach Warren Gatland's decision to opt for the youth of Evans against the defending champions hints at long-term planning for the 2019 World Cup. According the the New Zealander, 35-year-old Jenkins is unlikely to be at the tournament and Ospreys loose-head James is only two years younger. Evans, who missed out on selection for the 2015 World Cup, has also impressed the Wales management with his displays for the Scarlets in the Pro12. He said he was delighted with his selection and was full of praise for the senior players. "I started playing rugby when Gethin and Paul were doing really well," he added. "It was good to watch them and I'm still learning off them today. "It's awesome really to be picked ahead of a Lion and Paul, who has 60 plus caps, so you can take a lot of of confidence from that. "They are really tidy people as well." And asked if Jenkins had spoken to him following the team announcement, Evans laughed: "Yes, he just said: 'Your lungs are going to be burning on Sunday'."